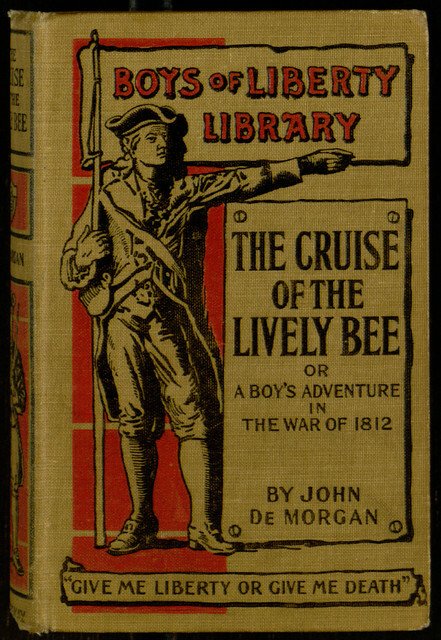 First published in the Golden Hours story paper from November 19, 1892 to January 28, 1893 and later reprinted in book form as part of a series called The Boys of Liberty Library, this tale details the adventures of a privateer called the “Lively Bee” as she fights for the American side during the War of 1812. The use of a privateer allows the story to use many of the trappings of a pirate adventure while simultaneously expressing patriotic sentiments and offering history lessons to its readers. 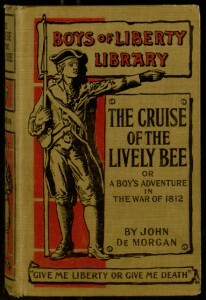 While the “Lively Bee” and its crew are fictional creations, they encounter several historical ships (such as the USS Congress and HMS Belvidera) and meet a variety of well-known figures, including David Farragut and Dolly Madison. This being a story paper serial, it’s definitely not all about dry historical facts. It also includes romance, at least one astounding coincidence, a bit of comic relief, and high levels of violence. Given its target audience, it also goes out of its way to point out the role of very young boys in much of the fighting. This will likely raise the eyebrows of contemporary readers, as will the book’s extremely sexist portrayal of women, but neither is particularly surprising for the period. In any case, it’s not hard to see how the story held the attention of its readers and kept them coming back for more installments. You can read the entire adventure online at Project Gutenberg, where it is also available for download in a variety of popular electronic formats.